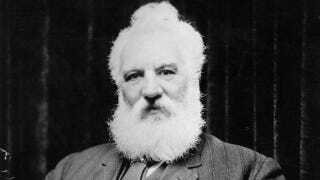 Researchers from the Smithsonian have restored a 128 year-old recording of Alexander Graham Bell's voice from a wax-and-cardboard disc. It's our first opportunity to hear what the famous inventor actually sounded like. The restoration, which involved the conversion of high-resolution optical scans to digital audio format, was conducted by physicist Carl Haber and curator Carlene Stephens of the National Museum of American History. Bell conducted his sound experiments between 1880 and 1886, collaborating with his cousin Chichester Bell and technician Charles Sumner Tainter. They worked at Bell’s Volta Laboratory, at 1221 Connecticut Avenue in Washington, originally established inside what had been a stable. In 1877, his great rival, Thomas Edison, had recorded sound on embossed foil; Bell was eager to improve the process. Some of Bell’s research on light and sound during this period anticipated fiber-optic communications. Inside the lab, Bell and his associates bent over their pioneering audio apparatus, testing the potential of a variety of materials, including metal, wax, glass, paper, plaster, foil and cardboard, for recording sound, and then listening to what they had embedded on discs or cylinders. However, the precise methods they employed in early efforts to play back their recordings are lost to history. After learning about Haber's success in restoring early recordings made in Paris in 1860, Stephens contacted him to see if he could do the same for Bell's artifacts. His scanning technique worked, this being the remarkable result.